Viewing students as consumers -- and consumers with strong ideas about how their instructors should treat them as learners and individuals -- can help good teachers become great teachers in the eyes of the people who matter most, according to a new book. Included: Tips for building relationships with students. Much research has been devoted in recent years to what makes a good teacher -- education, content knowledge, student test scores, evaluations. Little consideration has been given to the views of teachers customers -- the students who sit in their classrooms everyday. Students, in fact, have a lot of opinions about what makes a good teacher. 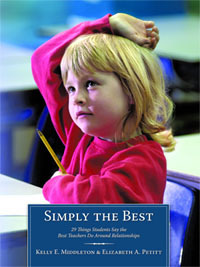 School administrators Kelly E. Middleton and Elizabeth Petitt captured some of those pointers in their book, Simply the Best: 29 Things Students Say the Best Teachers Do. Suggestions range from the very simple -- smiling at students and knowing their names -- to more personalized efforts, such as attending student events and visiting their homes. Middleton and Petitt argue that the best teachers take a customer service approach to education and focus on making connections with students and getting to know them as individuals. Teachers who do that, they write, see greater academic progress and fewer discipline problems. The two authors talked with Education World about their book and the pervasive effects of positive relationships with students. Education World: Why is building relationships with students more important these days? Kelly E. Middleton, Elizabeth Petitt: Relationships always have been integral to the teaching and learning process. However, building relationships in schools is becoming a non-negotiable -- something schools must embrace to ensure student success. Data suggests that, unfortunately, many students have little contact with their parents or other adults. Yet, the need exists within each individual to feel connected and to belong. Without an intentional focus on relationships, and systemic efforts to develop those for every student, the likelihood exists that many students will become chronically disengaged from school. EW: What are the benefits of strong student-teacher relationships? 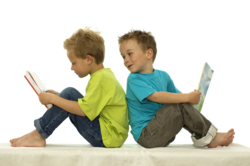 improved student social-emotional skills, such as caring, empathy, social responsibility. Dr. Robert Marzano suggests, The quality of relationships teachers have with their students is the keystone to effective classroom management, and perhaps even to the entirety of teaching. As one learns about having high expectations for all students through strong student-teacher relationships, it becomes apparent that relationships impact almost every aspect of education, from student achievement and closing the achievement gap to school safety. In fact, relationships permeate the culture of a school and indicate either a positive or toxic culture within the school. EW: How would you respond to the concern that teachers putting a focus on customer service could lead to lax classroom standards? A focus on customer service allows one to have higher standards and greater expectations because we know that students will work harder for educators who believe in them and who demonstrate in words and actions they care about them. Middleton, Petitt: The first reaction to that statement is that actually the opposite is true. A focus on customer service allows one to have higher standards and greater expectations because we know students will work harder for educators who believe in them and who demonstrate in words and actions they care about them. Perhaps Dr. James Comer said it best when he shared, No significant learning occurs without a significant relationship. Customer service that includes making connections with students and building relationships is not allowing students to do whatever they want in the classroom. It is not about becoming the students friend. It is about conveying to students that you know who they are; you have high expectations; you will treat them with respect; you will give them opportunities to demonstrate mastery of learning, even if it requires providing some additional assistance beyond the initial instruction; and that you honor the relationship that exists between you and every student, each and every day, without favoritism. EW: What do you think are the toughest to implement of the 29 things students say the best teachers do -- and why? Middleton, Petitt: Students want to know how that what they are learning is important in the real world. They have an innate desire to understand why it is important to learn a particular concept on a particular day. One of the toughest suggestions to implement professionally is relevance and real-world application. No one can argue with the importance and need to consider that aspect during instructional planning. However, the ability to incorporate relevance and real-world application with each instructional concept in each content area often proves to be a difficult task. The toughest of the 29 for teachers personally to implement probably relates to admitting making a mistake and knowing how to recover successfully. Sometimes as teachers, we are pre-programmed to think we need to be perfect; we need to have all the answers. Many equate mistakes with eroding student and administrative confidence in ones teaching ability. However, based on research, it is often better to make a mistake and recover from it successfully than never to make a mistake at all. Students see many desirable behaviors modeled when adults admit their errors. How can we teach students to take academic risks if we never convey through our own words that failure and overcoming a mistake are valuable learning experiences? EW: What would you say to teachers who say they are already overwhelmed and can't take the time to visit students' homes or attend their athletic events? Middleton, Petitt: Many of our teachers would probably reply, Not taking the time costs you even more in the long run! One of our teachers was asked by a group of teachers from another school district about how one goes about getting buy-in from other staff members who are reluctant to embrace that concept. Her response was, Do you want greater student motivation and fewer discipline problems in your high school? That is what Ive witnessed as a teacher, and my colleagues would say the same! The toughest of the 29 for teachers personally to implement probably relates to admitting making a mistake and knowing how to recover successfully. Schools are bombarded with increased expectations coupled with fewer resources, including unfunded or underfunded federal or state mandates. Many of those expectations stem from the battle cry for more accountability and testing, or more paperwork and policy geared toward a plethora of school issues. As we reflected on the efforts in our schools, we asked, Whats the most important thing in our district? We came to the realization that we had lost sight of the student, that is knowing who he or she is, taking time to interact, building a rapport between the home and school, and taking ownership of the individuals and how we interact with them in our schools. The majority of educators chose the profession because of the student-teacher relationship and their desire to make a difference in the lives of others. What we are observing is that a focus on developing positive relationships reconnects staff members with why they initially chose to become teachers. EW: How can teachers be better prepared to build relationships with students? Middleton, Petitt: A teachers content knowledge is crucial in improving student achievement. However, we must first see the students as individuals and what each brings to the table in terms of interests, strengths, gifts, and areas for growth. Building relationships begins with the simple things that matter most to students -- smiling at them, using their names, knowing who they are and what they like, allowing them to know who you are as a teacher, being consistent, not being afraid to admit you made a mistake -- and proceeds to thinking about how to use the relationship to connect students to learning and to give them ownership in the process. It means valuing who they are and what they have to say. We like to think of it as treating all students like you would want your child to be treated. John Dewey once said that what the best and wisest parents want for their child should be what we want for all children. This e-interview with Kelly F. Middleton and Elizabeth Petitt is part of the Education World Wire Side Chat series. Click here to see other articles in the series.